General Safety Instructions To avoid injury to your eyes, use care when removing and installing spring-loaded parts. Live ammunition must not be near the work area. 1. Refer to operator's manual. 2. 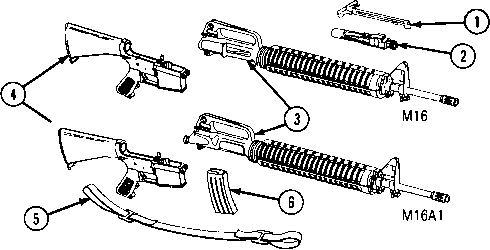 Install charging handle (1) and bolt carrier assembly (2) into upper receiver assembly (3). Join upper receiver assembly (3) and lower receiver assembly (4). 3. Snap on small arms sling (5) and install cartridge magazine (6). 1. Place test fixture rod (1) on bench and add test weights (2) until minimum load of 5.5 Ibs is reached. 2. Charge the rifle. Place the selector lever in the semi position. 3. Hold the rifle (3) in a vertical position. Place the end of the test fixture (1) over the trigger (4). Slowly raise the rifle in a line parallel to the barrel until the fixture and weights are suspended. 4. The hammer must not fall. If the hammer falls, the trigger pull is too light and the trigger and/or hammer must be replaced. 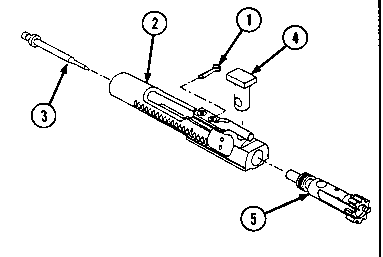 Replace the trigger and/or hammer in accordance with the maintenance procedures provided on pages 3-60 and 3-61. If replacement of hammer and/or trigger fails to correct light trigger pull, replace hammer spring (pg 3-60 and 3-61). 5. Add weights until maximum load of 8.5 Ibs is reached. Repeat the above procedures. The hammer must fall. If the hammer does not fall, replace the trigger and/or hammer (see pg 3-60 and 3-61).